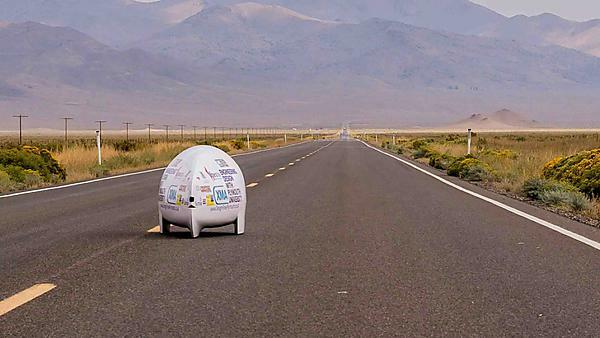 During the week of 12 to 19 of September 2016, cyclists from around the world gathered on State Route 305 outside of Battle Mountain, Nevada in a quest to break the human-powered land speed record. This is organised by the International Human Powered Vehicle Association (IHPVA) and was the 17th consecutive year of competition at this site, home of one of the straightest, flattest and smoothest roads in the world. The 4,619ft (1,408m) altitude course provides an acceleration zone of five miles leading to a 200-metre speed trap. The highway was repaved in 2009 and special consideration to ensure utmost smoothness was given by the Nevada Department of Transportation. Staff and students from the Faculty of Science and Engineering at Plymouth University launched an ambitious attempt to break the women's world land speed record. Building on many years’ experience of handcycle design, the team and athlete - Sarah - travelled to Battle Mountain, Nevada, for the World Human Powered Speed Challenge with their sights set on the existing arm-powered speed records. The women's benchmark was 24.76mph and Sarah had already exceeded 20mph in training so the team believed they could do it. And indeed they did! This was the second year that the University took part in the annual competition, and in 2015 – after an injury to their intended rider – project leader Adam Kyte managed to achieve a speed of 30.45mph despite having had no previous training. For 2016, the University teamed up with Sarah Piercy, who won the Women’s Wheelchair Marathon in London in 2000, in an attempt to take their handcycle – nicknamed Reynolds – to new heights. The shell remained the same as in 2015, although previous experience and ongoing analysis (including student dissertations) were used to make changes to various elements of the handcycle for 2016. Sarah's life has been a series of challenges. Born with arthrogryposis multiplex congenita, a condition which can lead to a contracting of the joints, she has always relied on a wheelchair. Inspired by the exploits of Dame Tanni Grey-Thompson and David Holding, Sarah became a member of the British Wheelchair Racing Association and began taking part in track events and 10k races. See who supported Project Nevada's attempt to bring home a world record in September 2016 and how they got involved. The design and build process has been led by Adam Kyte, Lecturer in Mechanical and Marine Engineering Design, alongside students Matthew Sharman (MEng Mechanical Engineering) and Oscar Whitmarsh (BEng Mechanical Engineering with Composites), with the help of technicians Julian Seipp, Richard Cullen, Rick Preston and Neil Fewings. Getting the aerodynamics right is key to designing a fast handcycle and through a range of undergraduate dissertations and Computational Fluid Dynamics (CFD) assignments, an aerodynamic shell shape was designed that students felt would give the best compromise between low drag and athlete power. A range of other student dissertations and projects focused on steering, power transmission, structural frame design and manufacturing techniques, culminating in Computer Aided Design (CAD) models which informed the build process. The project build required thousands of hours of hard work, drawing on the wide range of facilities available at the University of Plymouth. Aluminium components were cut using our water-jet cutter; CNC machined and welded using our TIG welding facilities. The most time-consuming item to build was the aerodynamic shell, and most of this work was done in the University’s Advanced Composites Manufacturing Centre (ACMC). The first step was to manufacture a “plug” of the required shape, cutting out and glueing 43 layers of MDF, and this was then machined to the required shape. A dedicated student then spent several weeks resin coating, sanding and polishing the plug to get an immaculate finish, and Glass Reinforced Plastic (GRP) was then laid onto the plugs to form the moulds for the shell itself (and for the vacuum-formed windscreen). The shell was laid up using a combination of carbon, glass and kevlar fabrics to give the right combination of structural properties. Cyclists from around the world gather on State Route 305 outside of Battle Mountain, Nevada in a quest to break the human-powered land speed record. The 4,619ft (1,408m) altitude course provides an acceleration zone of 5 miles leading to a 200 meter speed trap. Gareth Hanks set the new Mens Multi-track record at 73.95 mph in Team Tri-Sled's All Overzealous.